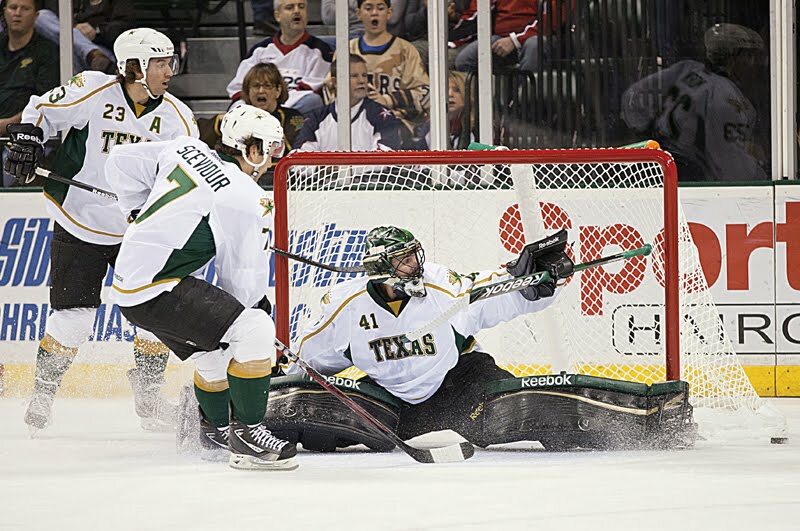 The Texas Stars extended their winning streak to three games with a 3-1 victory in Grand Rapids. Reilly Smith had the game tying goal, his second in as many games, and had a crucial play to get the insurance goal. Jordie Benn scored his second goal in as many games as well. Alex Chiasson also collected his second of the year. Cristopher Nilstorp had 18 saves on 19 shots on the night. Despite outshooting the Griffins 13-6 in the first, Texas found themselves on the wrong side of a 1-0 score at the end of the period. Landon Ferraro broke in alone and went high glove on Nilstorp for his sixth of the year. The Stars and Griffins skated to a mostly quiet second period, trading power plays mid period. Perfectly even on shots in the middle frame, Texas decided they also needed to even up the score. Reilly Smith scored his second in as many games, gathering the rebound of a Cam Barker shot with just 39 seconds left in the period. Even without the goal, Smith's name was all over the game. He had five shots and a plus-2 rating. The Stars took the lead in the third period with two goals just 43 seconds apart. Jordie Benn went first on the power play. Crashing the net with Sceviour, Benn collected his third of the year and second in as many games off a beautiful backhand dish from Sceviour. Texas led 2-1. Next it was Chiasson's turn. Reilly Smith drove the net on his brother, Brendan, with the puck kicking out to the point after the initial shot. Brenden Dillon's point shot was tipped by Alex Chiasson out front for the 3-1 lead. Despite Reilly's lack of a point on the scoresheet for the play, he was instrumental in making it happen. Texas needed to make a big stand at the end of the game, killing a late Travis Morin penalty. They did so with facility, continuously clearing the puck and killing clock. The win put Texas at 9-7-1-1 on the season. They are two games above .500 for the first time since the second game of the season. Texas stays in Grand Rapids to face the Griffins again tomorrow. 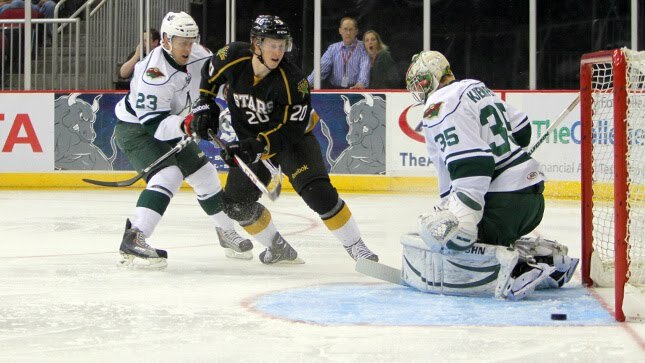 After two disappointing losses, the Stars bounced back with a 5-3 win over the Rampage this afternoon in San Antonio. Travis Morin, Matt Fraser and Francis Wathier each had two points, but it was Colton Sceviour with the game winning goal. The Stars scored two goals twenty-seven seconds in the middle frame and then answered back to a Rampage goal just forty six seconds later. Texas was 1/4 on the power play and perfect on the two penalty kills they had. 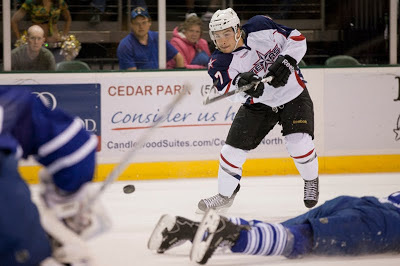 Jon Rheault opened the scoring for San Antonio in the eighth minute of the first period. The goal was a rather odd one, popping up over Cristopher Nilstorp and rolling down his back and into the net. The Stars would counter seven minutes later as Travis Morin collected a great feed from Jamie Oleksiak and backhanded one past Dov Grumet-Morris. The assist was Oleksiak's sixth of the year, showing the continuing maturation of his hockey vision. The Rampage and Stars were even on shots in the first at nine each. Texas dominated the second period after San Antonio's second goal. Drew Shore scored from the faceoff dot seven minutes in to make it 2-1, but Texas roared back. On the power play, Matt Fraser scored his sixth of the year to tie it at two. The play was assisted by Wathier and Morin. Just 27 seconds later, Wathier again dished off the puck, this time to Brenden Dillon, who scored his first of the year. The Stars led 3-2 to close the second. Jack Campbell would start the third period despite Nilstorp finishing the second. Nilstorp did not return to the Stars bench. Campbell was tested early and eventually San Antonio broke the seal. Drew Shore picked up his second of the night on an ugly rebound tally. Jon Rheault assisted on the tally for his third point of the night. Forty six seconds later, the Stars answered back. Matt Fraser shot the puck in from the corner. Colton Sceviour tipped the puck top shelf over Grumet-Morris for the 4-3 lead. Patrik Nemeth picked up the secondary assist, his first AHL point. Shots in the period were 14-8 and continued ramping up as the period wore on. 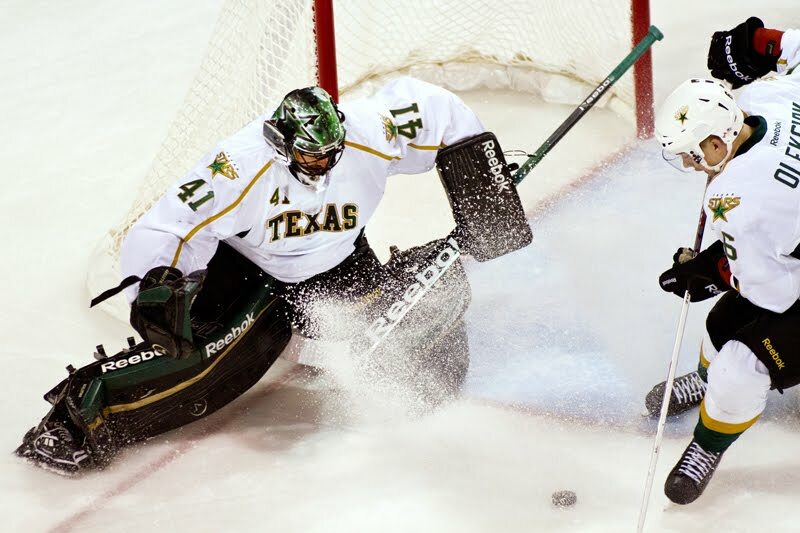 Texas got the last laugh though as Scott Glennie sealed things with a 2-on-1 empty net goal. His second of the season locked the game down at 5-3. Reilly Smith assisted. Texas reaches .500 with the win and will now travel to Rockford for their first of the season against the IceHogs. No word on Nilstorp at the end of the game. 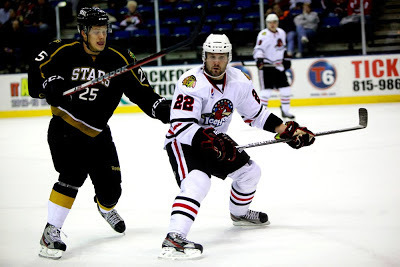 The Stars three-game win streak perished at the hands of the Oklahoma City Barons tonight in Cedar Park. The game hinged on a four goal second period for the Barons. "We gave them way too much and put ourselves in too deep of a hole to come back in the third," said Colton Sceviour, who had 3 points despite the loss. "We got a few bounces that didn't go our way and gave them some things that you can't give a team like that." Indeed, the Stars led the Barons 3-1 after the first thanks to goals from Cam Barker, Sceviour and Jordie Benn. The four goal capitulation in the second all came in the course of just over eight minutes. "We've had a few real good second periods [in the past few games]," said Coach Desjardins. "Tonight they had things get going. They're an explosive team, and once they get going they're hard to stop." Jordan Eberle opened the scoring for the Barons just 1:47 into the game, collecting a rebound of a Taylor Hall-tipped, Fedun shot. Texas answered right back with an even-strength marker from Cam Barker on the left point. Reilly Smith was in front causing havoc but did not tip the puck. On the penalty kill with six minutes left in the first, Texas went up 2-1 thanks to Colton Sceviour's shorthanded tally. Using a Barons D-man as a screen, he whipped one past Yann Danis from the high slot. "Any time you put four forwards on the power play, there's times that the forward has that mindset to jump down the wall," said Sceviour. "You're not used to being at the blue line." Jordie Benn completed the high-scoring first with a power play tally down low, assisted by Sceviour. The winger popped the puck out front for the easy tap in by Benn and the 3-1 score after 20. The second period was the burner for Texas. Teemu Hartikainen scored on a wrister past Nilstorp's shoulder to start things. Toni Rajala went next to tie things at three, a two-on-zero rush that appeared to be offsides. Texas's calls to the referee on that topic went unheard. Justin Schultz scored his ninth of the season from the point to go ahead by one and Taylor Hall scored his fourth of the year on the two-man advantage. That set the score at 5-3. "You can't turn the puck over. They have a lot of speed and if you're giving them [odd man rushes] that's where they get their game. If we play in their end, they can't do anything." Texas would get quite a few opportunities to even the score on the man-advantage in the third. The Stars squandered three power plays and then took two penalties of their own to end the game. Antoine Roussel made things interesting with just over five minutes left, lifting a backhand over Yann Danis, scoring a shorthanded goal to make it 5-4 OKC. Texas would give it back though as Cam Barker took a late boarding call. The Barons cashed in for their sixth and final goal. The Stars were outshot 30-17 through two periods and only made up part of the deficit in the third, outshooting OKC 10-4. "We needed to take a page from their book and throw pucks at the net." With the loss, the Stars drop below .500 to 6-7-0-1. Texas takes on Abbotsford on Friday. 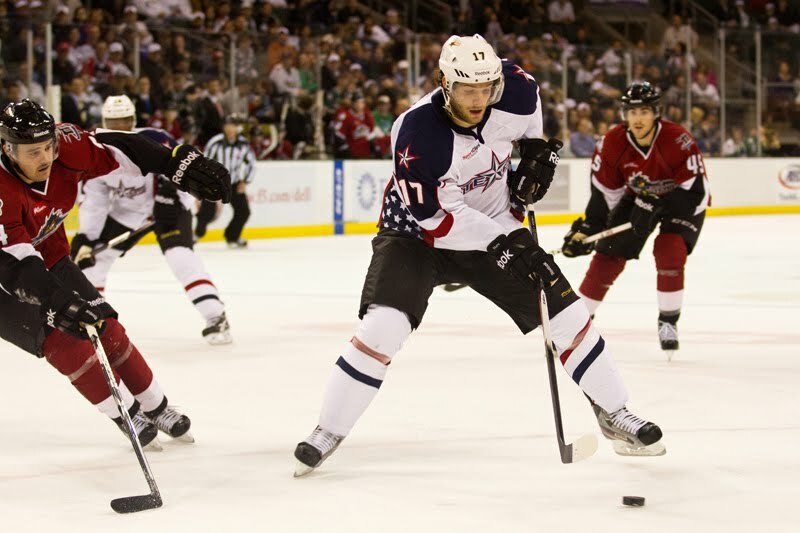 The Oklahoma City Barons visit the Cedar Park Center for the first time this year tonight. Previously touted as the team to beat in the Western Conference, let alone the entire AHL, the Barons are hardly even the top of their own division as we near the quarter-pole of the season. That honor goes to the Charlotte Checkers at 24 points, a mark the Barons are behind by six. They are hotly followed by Houston just one point behind. Texas is five behind the Barons but has two games in hand. The talented roster hasn't had a problem, at least recently, getting the puck into the net. It's mostly been a problem of keeping it out. The Barons are at three goals for per game and three goals against per game overall on the season so far. That's a pretty nasty recapitulation from last year's club that helped their goalie, Yann Danis, to the best record in the AHL and Goalie of the Year honors. This year, Danis is a rather pedestrian 6-4-1 with a 2.76 GAA and .914 SV%. His backup, Olivier Roy, is 2-2 with a 3.05 GAA and .898 SV%. After stymieing the #1 ranked Charlotte PP, Texas will get the honor of facing the #2 ranked PP tonight. Clicking at 25% and featuring a top line with three top-ten draft picks, the power play is not to be trifled with. The Stars take the fewest penalties in the league, but anything could be costly against this unit. Zip those lips and be on your best behavior. Texas is humming along at 95% on their last twenty penalty kills. The OKC penalty kill, on the other hand, is definitely a weakness to exploit. The Barons are top ten in penalty minutes taken per game and are tied with the Stars for the worst overall penalty kill in the league (75.4%). The arc of Texas's PK is bending upwards; OKC is as well, killing 14 of their last 15. Names to watch for tonight include defenseman Justin Schultz (8-13-21) and forwards Taylor Hall (3-3-6 in 7 GP), Ryan Nugent-Hopkins (7-10-17), and Jordan Eberle (6-13-19). Those four plus Teemu Hartikainen (4-8-12) form the first power play unit. TendTheFarm.com reports that the Barons have injuries to Tanner House, Tyler Pitlick and Antti Tyrvainen. Cameron Abney and Toni Rajala were called up to fill those gaps. The Barons come in to CPC having won their last two in a row, both against Milwaukee, and having collected points in their last four. 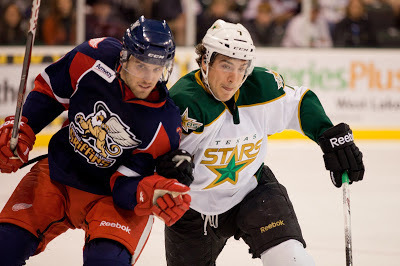 The Texas Stars announced this afternoon that defenseman Hubert Labrie has been recalled from the Idaho Steelheads. Additionally, goalie Josh Robinson has been reassigned to the Steelheads. Labrie has spent the entire season so far with the Steelheads. In thirteen games, he has a goal and an assist and a plus-4 rating with 14 PIMs. Robinson is 5-0-1 for the Steelheads and did not make it into a game for Texas during his callup. This makes the blue line pretty crowded. Texas already has seven healthy D skaters, barring injury to someone else during practice this week. Jordie Benn went full contact in morning skate last Saturday, so he's back in the lineup as well. There could also be illness involved. It is cold and flu season, after all. Is this another callup like Austin Smith and goalie Josh Robinson? Granting the long odds that Labrie would get into a game, is this a reward for his good play in Idaho? I don't believe that it's a motivation move for the Stars defensive corps, which has been improving over the past few games. In summary, don't expect Labrie to get into many games while here unless there are other circumstances at play. 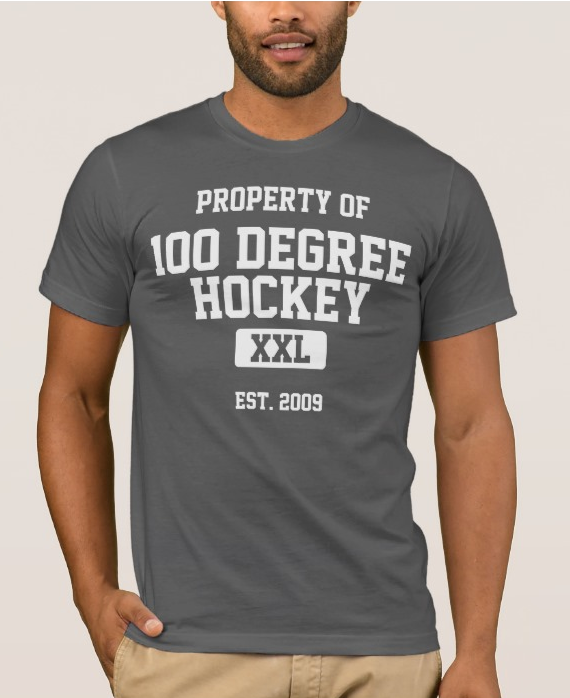 However, his play in Idaho has earned him this callup, which is a good thing long-term for the Dallas and Texas Stars prospect depth at defense. 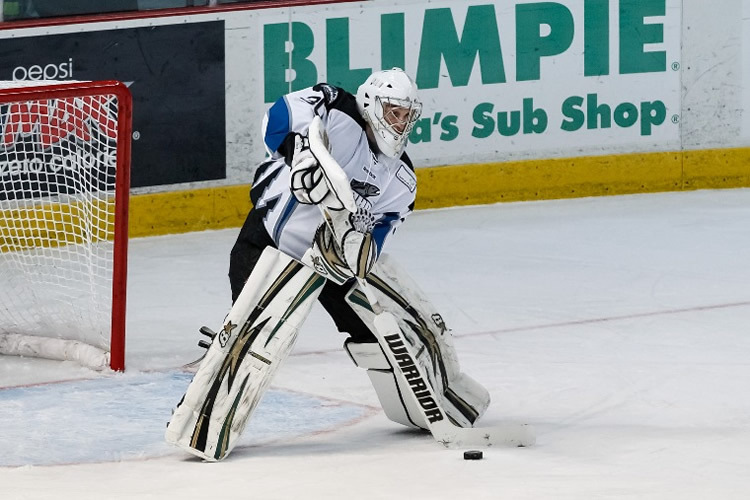 For Robinson, he will look to continue his strong play in the net for the Steelheads. The team has not suffered while he was gone and Beskorowany was at the helm. However, it will be good to get him in game action again and continue to develop him as a strong callup choice in case of injury. The emergence of Cristopher Nilstorp over the past few games surely made this an easier assignment. Texas Sends Austin Smith to Idaho; Did His Callup Do Its Job? 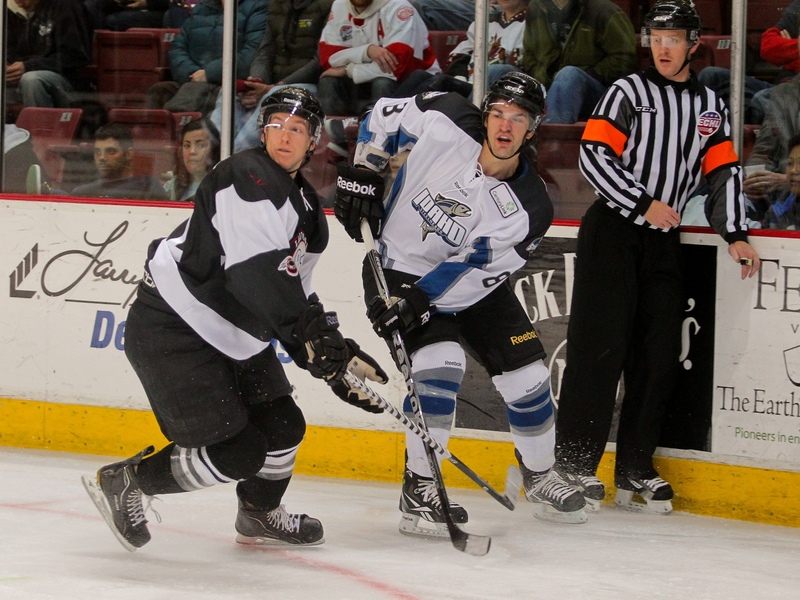 After calling up the Colgate product last week, Texas has returned Austin Smith to the Idaho Steelheads. Smith played in no games while he was in Cedar Park. His arrival last Saturday the 10th, however, marked the turnaround in the Stars fortunes. Smith was involved in each of the warmups for the games while he was here but was ultimately scratched. The Steelheads just recently had an 11-game unbeaten streak broken up. Smith could probably get to Idaho in time for tomorrow's game against NHLer Scott Gomez and the Alaska Aces in Boise. At the time, the callup of Smith made great sense. A team struggling to score brought up a player who did just that in the college game. However, without him in the lineup, Texas's offense picked up. Was it a pressure/motivation thing for the skaters already in Cedar Park, seeing a chance for diminished ice time if they didn't contribute? It's possible. Regardless, Smith will look to continue his good fortunes in the ECHL where he has five points in six games. 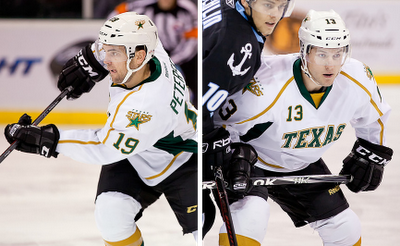 Something about the Charlotte Checkers brings out the best in the Texas Stars. The number two team in the Western Conference came to town for a second time this evening and again left with a shootout loss courtesy of the Stars. "That's a great team," said Toby Petersen, who scored the game winner in the ninth round of the shootout. "We definitely bring our game up against them." Cristopher Nilstorp again had a perfect record, stopping all twenty-two shots he faced in regulation and overtime. Dan Ellis was equally stellar before the shootout, stopping 31 Texas shots. "Nilstorp's been fantastic for us. It's nice to know if we make a mistake, he'll be back there to bail us out." Texas opened the game with an early PP chance in which Matt Fraser banged one off the post, one of the best chances of the night. Then Texas ceded three power play opportunities to Charlotte through the rest of the period. The #1 ranked power play in the league was shutdown by patient penalty killers and the steady hand of Cristopher Nilstorp in net. "We've done a better job [on the penalty kill]," said Petersen. "We've cleaned some things up." "I think there's more confidence in the [penalty killers] and we trust each other more," added Nilstorp. In Coach Desjardins' opinion, the second period was "the best period we've played all year." The Stars outshot Charlotte 13-3, took no penalties (but also earned none themselves), and still came up scoreless at the end. It was a solid goalie duel. The Stars killed off one final penalty in the third period and had another great chance from Antoine Roussel as time wound down. Overtime saw Charlotte outshoot Texas 3-1 but no scoring. For the second time in as many games between the two teams, Texas went to the shootout with Charlotte. Reilly Smith had a great chance to score in the first round but knicked his backhand off the crossbar over a sprawled Ellis. Jerome Samson scored for Charlotte in the second round, but Matt Fraser brought the crowd to its feet in the fourth with the tying marker. Rounds six, seven and eight passed without a goal from either side. Finally, round nine would end it. "I went in with the idea just to shoot it," said Petersen. "The ice was bad out there. My idea was to go in there and shoot and try to get lucky." And get lucky he did, beating Ellis five hole for the win. "It's ironic that the day we're supposed to score to get the teddy bears on the ice, we couldn't get it done in regulation." With the win, Texas stretched its points streak to four games and win streak to three. Cristopher Nilstorp now has back-to-back shutouts and a streak of 153:09 overall. He is the undisputed #1 in net for Texas right now. Texas faces Oklahoma City next on Wednesday. Eakin missed the second and third period after blocking a shot in the first. He went for xrays, but they came back clear. He was in a precautionary walking boot after the game. Jordie Benn was scratched tonight but not injured. He was cleared to play tonight, but Texas decided to hold him out just one more game. After wins in their last two and points in their last three, Texas faces a big test over their next two games starting tonight against the #2 team in the conference, the Charlotte Checkers. The Checkers, who lead the South Division, come to town for the second time on the year after opening the Cedar Park Center for the 2012-13 season and falling in the seventh round of the shootout off the stick of Jordie Benn. "They came in here and it was a good game," said Matt Fraser. "We managed to squeak it out in the shootout and they're going to come in here looking for redemption." Since that point, Charlotte has amassed a 9-3 record with goalie Dan Ellis picking up Goalie of the Week honors to boot. They come into the Cedar Park Center on a three game winning streak, having beaten the Rampage in San Antonio last night 4-3. "We just have to keep things to the basics and play shift by shift," Fraser added. The story of the last week has been the special teams turn around. Since the Saturday game, the power play is 4/16 (25%), and the penalty kill is 15/16 (93.8%). While still mired in 24th and 30th place respectively due to the inertia of their previous play, the arrow is pointing in the right direction. Texas has been waiting more on the penalty kill, being patient and looking for lanes to clear, and getting in shooting lanes and giving up the body as well. Getting those clears and changing to keep legs fresh is also helping. Here's the problem though: Charlotte has the #1 ranked power play in the league right now at 28.8%. Zach Boychuk and Drayson Bowman have four power play goals each; Zac Dalpe has three. Stopping the Charlotte power play is a key to the game. On the power play, it's been about keeping it simple. Also helping is the play of Matt Fraser. Fraser had three of the Stars' four power play goals this past week. That is where he did much of his damage in his rookie season (11 PPG of 37 total) and where the Stars need him to continue to score this season. As much as scoring from Matt Fraser is appreciated, however, Texas needs goals from their depth scorers too. Francis Wathier has six assists but has yet to pot a goal. Toby Petersen only has 1-1-2, and Alex Chiasson just has a goal to his name. The goal from the fourth line (minus Gazdic, plus Wathier) last game helped the case for depth scoring, but Texas still only has one player with double digits points: Cody Eakin. As of today, the Texas Stars are carrying fifteen forwards, seven defenseman and three goalies. That's 25 players total for those keeping track. Only eighteen skaters and two goalies can suit up on any given night, so that leads to some questions for those guys on the fringe. Texas further complicated those questions over the last week as they recalled both goalie Josh Robinson and forward Austin Smith. Coach Desjardins firmly stated that there are no injury issues in the Stars goaltending ranks, so the callup of Robinson is definitely being used as a wakeup call for the Stars' Jack Campbell. Coach Desjardins insisted it was a reward for Robinson, who has been killing it in the ECHL at 5-0-1. "Robinson's been playing real well," said Desjardins. "We thought we'd pull him up and give him a look." However, with a 3.30 GAA and .868 SV%, there is no question that Campbell is not performing to the standard expected of a goaltender drafted in the first round. His work ethic is unimpeachable; he is often cited as being the hardest working goaltender in practice that many skaters have ever seen. However, it's the in-game portion that counts. Against Lake Erie, he appeared timid, backing into the net and not challenging shooters and cutting off angles. Both Texas goaltenders have had issues with allowing "easy" goals, that is, shots with little traffic from distance. Those are supposed to be the easy ones. Nilstorp has clearly rebounded with his two wins in a row here. Campbell last played on Saturday and is clearly a bit in the doghouse. As to whether Robinson gets a start, Coach Desjardins was hesitant. "Nilstorp is playing well so he'll probably get a little more." It is extremely unlikely that Robinson gets a start, despite how well he has played in the Coast. What sort of bind would White and Desjardins be in if Robinson started a game and pitched a shutout? Would they send their #11 overall pick, Campbell, to the ECHL with Tyler Beskorowany? Coach Desjardins has shown willingness to bench players who aren't performing despite their pedigree or draft status, but that seems highly unlikely no matter how you cut the cards. The schedule is pretty spaced out for the next few games with Texas not facing back-to-back games until a 3-in-3 to start December. It is entirely believable that Nilstorp could start every one. He is used to the challenge of being the starting tender from his time in Europe. Also on the roster are fifteen forwards. Mike Hedden, Taylor Vause and Austin Smith all were scratched last night. That combo right there could form a very nice third or fourth line for the Stars in a non-lockout year. However, it's a numbers game. It was set to be a hard year for players like Hedden and Vause once the lockout started. The good news for those two players is that Desjardins plans to rotate them into the lineup ahead of Austin Smith. "We have a few guys up who aren't in the lineup. It's hard to bring someone in [A. Smith] and sit the guys that have been with you all year [Hedden, Vause]. Austin looks better and is getting his confidence. The other guys will probably get a chance first though." Again, there is no regard for pedigree or draft status from Desjardins, and that's probably a very good thing. Scott Glennie, who potted his first of the year last night, sat for eight games this season. If the first round draft pick can take a seat for underperforming, Austin Smith is definitely going to have to show that he has earned his ice in practice to bump out one of the players already in. The play of the fourth line last night makes it harder to break up that unit. Smith was in warmups last night but was ultimately scratched. Close, but still not close enough. Would it be more beneficial for him to get ice time in the ECHL with Idaho? He had five points in six games there. Personally, I would send Smith to the Coast until the Stars are ready to use him in the game. In that situation, he can come in warmed up and primed to go instead of not seeing game action for many games the next time he suits up for Texas. Three goals from Texas and a clean sheet from Cristopher Nilstorp earned the Stars two points at home tonight against the San Antonio Rampage. "We finally got a win at home, which is nice," said Coach Desjardins. The shutout performance from Nilstorp was his first AHL shutout. "It feels better and better. When you win, you grow more confident," said Nilstorp. "I could see the puck all the way tonight, and the guys helped me with the rebounds." Matt Fraser had two of the Texas goals, including one on the power play. Texas generated two of their three goals off turnovers. "We have to be a team that's hard on the puck. We get guys in the corners mucking it up, [generating turnovers]," said Fraser. Special teams were the story of the night, however. 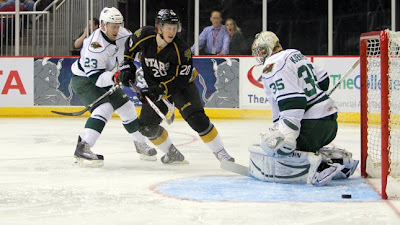 The Stars blanked the Rampage on six PKs and scored on one of their three power play chances. "It was easy to improve; we had some really bad numbers," said Desjardins. "Every night it's getting better." Luke Gazdic and Eric Selleck kicked off the thirty-sixth matchup between the two clubs with a fight just three minutes into the first period. The Stars killed a Patrik Nemeth tripping penalty with facility and then a double minor to Reilly Smith that stretched over the period break. Cody Eakin picked up a high-sticking call of his own forechecking behind the Rampage net, giving the Rampage a minute of 5-on-3 time. Texas killed all of the power play time and earned one of their own thanks to a Jon Rheault slashing penalty. On the ensuing power play, it was Matt Fraser picking up his fourth of year. On a net mouth scramble, Fraser popped the puck in between Markstrom's legs, a slow dribbler that crossed the line in no hurry. Eight minutes later, Fraser picked up another thanks to a big play by Colton Sceviour. Sceviour upended Andre Deveaux in the Rampage zone to generate the chance. He passed the puck down to Cody Eakin who skated behind the net and distributed it to Fraser in the slot, who snapped it past Markstrom's right shoulder. It was Fraser's fifth of the year. Another Rampage turnover generated the Stars third goal of the night. Francis Wathier on the forecheck stole a puck from the San Antonio defense. He fed it to Roussel and then to Scott Glennie in the slot. Glennie whipped it on net, five hole again, past Markstrom for the 3-0 lead. Texas locked it down in the third period and kept the score at 3-0, despite two power plays for each team. "The PK guys have been doing a great job," said Fraser, who does not play on the penalty kill. "It takes a lot of cajones for guys to go out there and step in front of a shot." 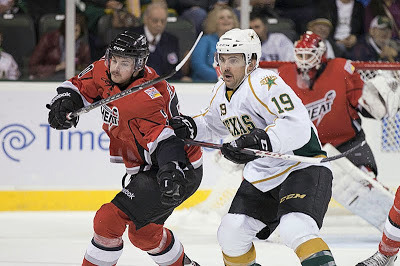 Texas takes on the Charlotte Checkers on Saturday, a powerful team that will serve as a great measuring stick for the club's recent success. The Stars scratched Jack Campbell in favor of Josh Robinson in the backup role. "Robinson's been playing real well," siad Desjardins. "We thought we'd pull him up and give him a look." He was unsure if Robinson would get a start, saying "Nilstorp is playing well so he'll probably get a little more." Austin Smith was also pulled up from Idaho but has yet to play in a game. Desjardins had the following to say on that matter: "We have a few guys up who aren't in the lineup. It's hard to bring someone in and sit the guys that have been with you all year. Austin looks better and is getting his confidence. The other guys will probably get a chance first though." In the only AHL game on the slate this evening, Texas welcomes San Antonio to the Cedar Park Center for what is somehow only the second meeting between the teams this season. The only previous matchup was the season opener for both teams, a 2-1 win for the Stars at San Antonio. The Stars and Rampage share the same 4-6-0-1 record but have come about it in different ways. Texas started hot before dropped six of seven. Then the club picked up their game over the past weekend and earned three points in their final two games of a 3-in-3. San Antonio has spread out their winning having not lost or won more than two games in a row. They come into Cedar Park tonight on a two game losing skid, having been outscored 12-8 in just two games. Dov Grumet-Morris, savior of the Rampage's 2011-12 season, was uncharacteristically charitable in a 7-5 loss to Houston on Tuesday. Prior to the seven goal game, DGM had allowed just six goals in only five games of work. While the defense has been stout, the offense has not been similarly gifted. Prior to the 7-5 game, the Rampage were averaging 2.2 goals/game. The Houston game bumped that average to 2.45. Neither is good enough to overcome a greater than three goals against average as a team. Rookie Drew Shore leads the club on offense with 2-7-9 in 11 GP. Jon Rheault has the most goals at 5-3-8 in 11 GP as well. Former Chicago pugilist Andre Deveaux comes in next at 3-3-6 in 9 GP; he was suspended for the other two. Former Star Greg Rallo has yet to turn on the offensive switch this season. The 31-year-old center has only two goals and an assist despite playing in all eleven games this season. He is also an uncharacteristic minus-5. For the Stars, things are on the upswing after last weekend. The turning point of the season may very well have been the last three minutes of the Lake Erie game. To guarantee that point, Texas will need to come out strong against the Rampage tonight. 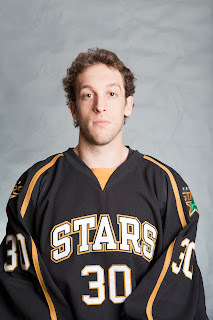 Complicating the picture for Stars fans is the callup of rookie goalie Josh Robinson from the ECHL. Robinson is doing fantastically well in Idaho, posting a 5-0-1 record in six games. However, neither of the Stars goaltenders appeared to be injured in this weekend's games. How the Stars use Robinson tonight will say a lot about the situation. Regardless, it will be a question in postgame. 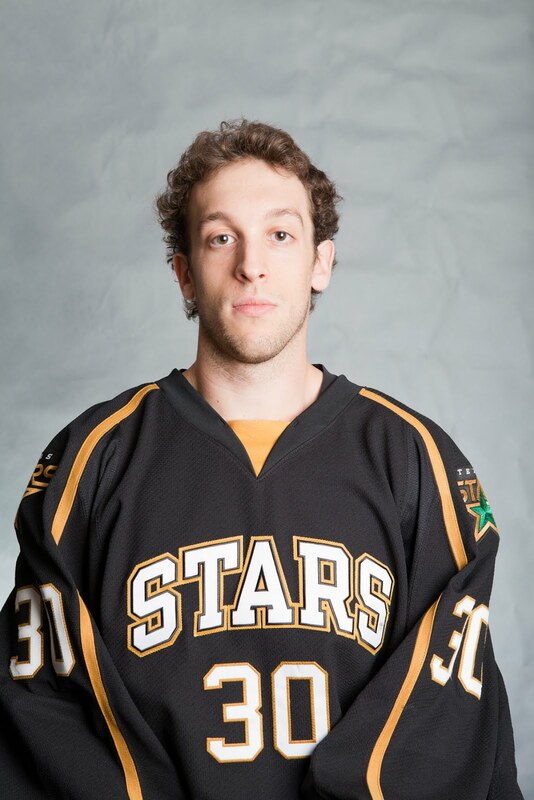 Also a question mark will be the Stars usage of Austin Smith. After his callup on Saturday, he hasn't factored into any games. With Coach Desjardins professing earlier in the season his tendency to stick with the same guys once they've won a few, it could be that Smith doesn't see game time for a while. The Stars earned two points in Houston thanks to solid goaltending, improved special teams and goals from their goal scorers. This was exactly the kind of game that the Stars needed to vault themselves into a good position with a few days off ahead of them. Goals from Cody Eakin, Tomas Vincour, Travis Morin and Antoine Roussel combined with 26 saves on 28 shots at Cristopher Nilstorp. The penalty kill went 5/6 and a power play goal helped pad the score. The Stars got started early tonight, scoring first for the first time since their October 24th win over Milwaukee. 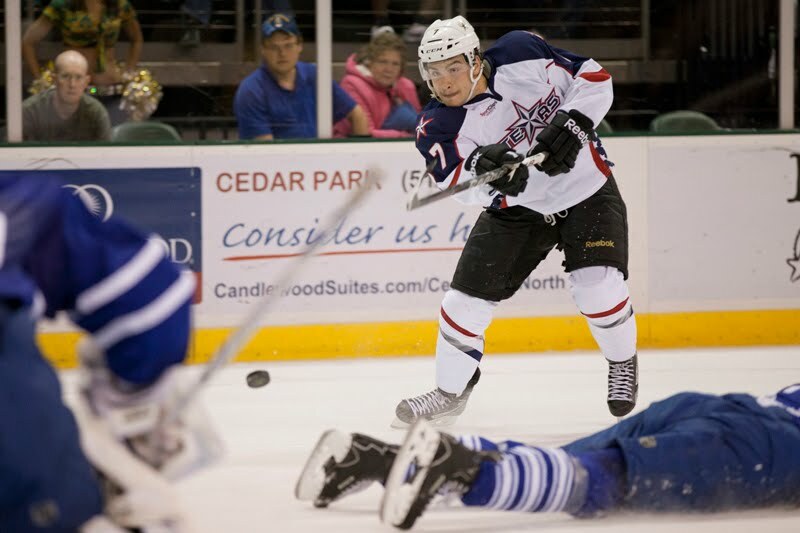 The Aeros were guilty of a too many men penalty, which send Texas to a quick power play. Cam Barker found Cody Eakin with a long breakout pass and Eakin beat Darcy Kuemper low through the wickets for the 1-0 lead. Cristopher Nilstorp picked up his first AHL point with the second assist on the play. Tomas Vincour notched his third of the year just six minutes later. At even-strength, Vincour picked a corner on Kuemper from distance and set the score at 2-0. Reilly Smith and Brenden Dillon assisted on the play. Houston got one back on the power play just three minutes later. With Dillon in the box, Kris Foucault popped the puck over splayed bodies in the crease to cut the lead to 2-1 for the Stars. Travis Morin went next though, regaining the Stars' two goal lead thanks to some fortuitous bounces. Darcy Kuemper watched the puck bounce off his helmet and onto the stick of Morin, who buried it for his third of the year and a 3-1 lead. The Stars finished the period with a 12-8 shots advantage. The second period was relatively quiet, compared to the penalty and goal filled first. Jason Zucker had the only tally of the period as he tapped in his own rebound past Nilstorp for the 3-2 marker just short of the twelve minute mark. Houston outshot Texas in the period 9-8. Ahead as the third period began, Texas extended their lead thanks to the fourth line, always a positive sign. Scott Glennie carried the puck in and down low behind the net. He slid it out front off the side of the net, and Antoine Roussel managed to find it and slam it home for the 4-2 lead. The goal was Roussel's second of the year. The scorers did not award any assists on the play. Texas closed out the game with some solid special teams play, killing off a Wathier interference call and a Fraser delay of game call in the third. Texas finally started to get some bounces, coming back from down 4-2 to tie the game in the final second of regulation before falling in the shootout to the Lake Erie Monsters. "For us, it was great to get the one point," said Coach Desjardins. "Another half a second later, we wouldn't have gotten any." The Stars never led in the game but came back each time to tie up the score. Matt Fraser had two goals on the night, including the game-tying tally as time expired. "On the last play it was just a lucky play behind the net. It was good to get a bounce there," said Fraser. The penalty kill was much improved, shutting out Lake Erie on four tries, while the power play was 2/7. "We knew as a team it wasn't up to par," said Fraser. "Credit to the penalty kill guys, sacrificing their bodies out there." Lake Erie struck first in the opening frame as Luke Walker slipped behind the Texas defense and wristed one past Jack Campbell. Texas responded well with solid play and earned several power plays, eventually cashing in on a 5-on-3. Matt Fraser potted his second of the year on a nice rebound. "Every game you want to start quick but we responded well after they scored," said Desjardins. "We could have gotten disheartened but we stayed in it." Texas ended the first with a 21-4 shots advantage but only a tie score at one a piece. The clubs traded goals again the second period. Bryan Lerg went first, snapping one past Campbell glove-side for the 2-1 advantage. Tomas Vincour, back again with Reilly Smith and Cody Eakin, grabbed his own rebound off the post and shot it in from the low right wing circle. The Stars came out for the third period and allowed two Monsters goals six minutes in, taking the air out of the building and sending many for the exits. Mark Sgarbossa went five hole and then just fourteen seconds later Brad Malone danced around Campbell to set the lead at 4-2. As the disheartened fans poured out while the game wound down, Texas showed them that it was far from over. With the extra man on the ice, Cody Eakin popped home a rebound off an offensive zone faceoff. It was 4-3 with two minutes left. Time winding down in the third, the Stars had six men on the ice to Lake Erie's four thanks to a late period boarding call. As the clock hit zero, Matt Fraser popped home a paunchy bounce of the end boards to tie things at four. Cam Barker assisted on the goal, his third helper of the night. The Monsters and Stars went to overtime where Texas outshot Lake Erie 5-2. The Stars' best chance for a goal was a point shot by Fortunus that glanced the post and rebounded harmlessly to the corner. The game instead went to the shootout. In the skills competition, it was all Lake Erie. Malone, Lerg and Mark Olver scored for the Monsters while only Reilyl Smith managed to find twine for Texas. The Stars, however, will take the point. Final shots on goal were 49-27 for Texas. Jordie Benn was involved in a scary play at the end of the third. Benn was boarded and then engaged in a fight with Carey. As the fight ended, Benn fell backwards into the boards. While he did not hit his head on the top of the boards, it appeared that he did hit his head on the boards on the way down. Benn got up but had to be helped from the ice. He appeared confused and/or was refusing to leave the game. Texas head coach Willie Desjardins stated Benn would be "out for a little bit". Coach Desjardins on Cam Barker: "Barks is a good player. He's good on the power play. He wants to win, and sometimes gets caught doing a little too much." It was unclear at press time, but it is believed that the Stars set a franchise record with the 21 shots in the first. 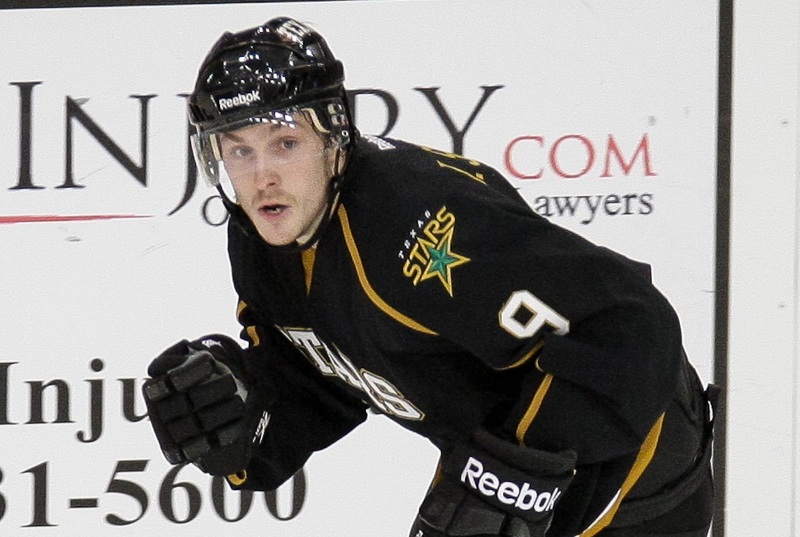 UPDATE: Stars have recalled Austin Smith from Idaho. He had 3 goals and 2 assists in the ECHL. After the Stars last game against the Monsters, it was pretty clear that they had a special team this season. That early premonition has come to fruition as they come back to Texas tonight with an 8-4-0-0 record and in 4th place in the West. How are they getting it done? They aren't playing lockdown defensive hockey as much as a Milwaukee or Texas teams of past. However, they are getting solid goaltending from rookie Calvin Pickard (2.41 GAA, .926 SV%). Mostly they have scoring depth and are using that to put the puck int he net. 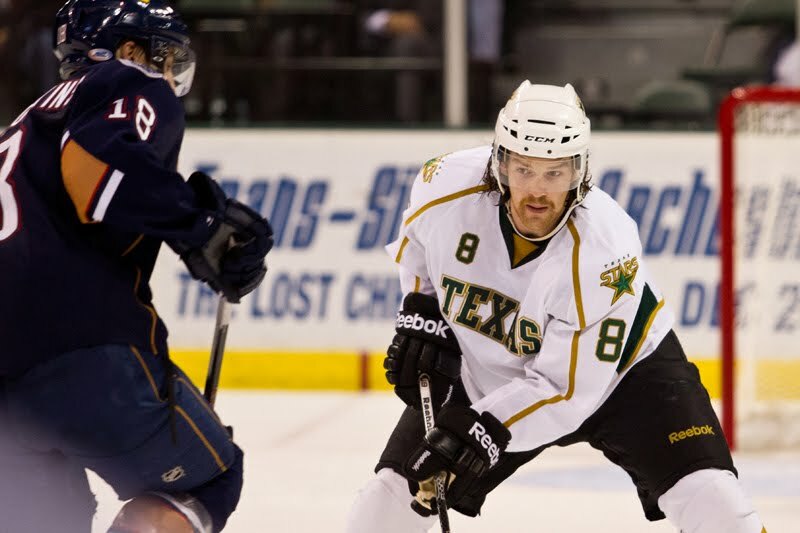 Texas's top scorer, Cody Eakin, has just seven points in nine games. Lake Erie has nine players with seven points or more, including three rookies. Mike Sgarbossa leads the club on offense with 5-6-11, but Thomas Pock is tied with him in point a 3-8-11 as well. Former Jamie Oleksiak teammate Andrew Agozzino checks in just behind at 6-4-10 with a team-leading plus-9 rating. Not bad for an undrafted rookie. The Stars need the same scoring depth the Monsters have found in their game. Only two of Texas's skaters have more than one goal on the season (Morin and Eakin). Texas is tied for last in the league in goals scored. Albany, the other club at 16, is also in last place in the East. It's not like the Stars aren't getting shots; they are. Those shots just aren't quality chances. Last night on the power play opportunities Texas had, they generated just one scoring chance when Reilly Smith missed the open net in the first PP opp. On the PK, Texas has regressed even further, sliding to 64.9% on the kill, worst in the league. Maxime Fortunus said that the Stars need to take fewer penalties to help their PK. 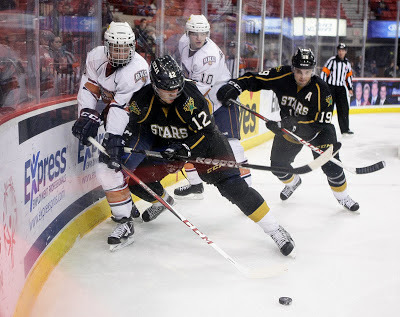 However, the Stars have given their opponents the fewest shorthanded opportunities in the league. Taking penalties is not the problem; killing them off is the problem. Last night there were several times where Texas got the puck on their stick and then failed to clear or cleared the puck directly to a Marlies skater. Take the extra tick to look up and find the open space or send it high off the glass. The PK is not the time to be looking to break out. Clear it, and get the change. After six days off to rest and prepare, the Stars dropped a 3-0 decision to the visiting Toronto Marlies tonight in Cedar Park. Jussi Rynnas had 31 saves for Toronto in the shutout performance while Leo Komarov had two goals. Texas has scored just three goals in their last three games and has now been shutout twice on the young season. Goals are hard to come by for the club. "I'm sure our next goal is going to be a garbage goal," said captain Maxime Fortunus. "We have to take our shots." Coach Desjardins added: "You have to make [the goals] go; you can't just hope. You have to create chances. You get streaks every once in a while in hockey and you have to break them. No one can break them but you." Also a liability was the penalty kill, which allowed two tonight on four opportunities. The Stars, ranked last in the league in the penalty kill at 66.7% coming into the game, worked on shorthanded opps all week in practice. "It's a process," said Fortunus. "We're not going to get it back to 85% in two games." The Stars came out of the gate flying. They were playing physically, banging bodies and generally creating havoc on the ice for the Marlies. All indications in the first pointed to a strong game for Texas. However, that tempo dipped as the period wore on. "We're trying to get to the point where we keep it up shift after shift. We have to keep our tempo," said Fortunus. Koharski told Fortunus, "Our player knocked off the net, so he didn't want to review it." Desjardins said: "[Koharski] just said he made the call and he saw it so there was no need to review it." The second period saw another goal, this time on the Toronto power play. Patrick Nemeth went to the box on a double minor for high sticking. It was a strange play where Jerry D'Amigo ran into Nemeth, but Nemeth got the penalty as he lifted his arms and stick as to D'Amigo's face as he reached him. On the power play, an unlucky bounce off Fortunus's skate ended up on Kamarov's stick; he cashed in for his second of the night. The game was capped off with another power play goal from Toronto. Veteran Cam Barker took an undisciplined penalty, checking a Toronto player after an icing call. Ryan Hamilton slipped behind the Texas defense and then around Nilstorp to finish things up at 3-0. Desjardins liked the number of shots but indicated that the team needs to work harder to win the battles around the net to win. "Nothing matters from what happened; It's only what's in front of us." Vincour swapped down the lineup to try and spread out scoring. However, he seemed nearly invisible in the game. He recorded no shots and was otherwise unnotable. After what seemed like an eternity for Cedar Park hockey fans, the Stars return to action for two games in two nights at home after playing just two games over the past two weeks. Tonight's opponent, the Toronto Marlies, always brings the crowds of Austin-based Canadians to the CPC. After winning their first two games, the Stars are on a mighty slide, losing five of their last six. In fully half of the games this season, Coach Desjardins has made a goalie change at some point in the game. It's difficult to pinpoint at this moment what the problem is. There are a lot of rookies in the lineup, but many teams have succeeded with rookies before. There are clearly some shot quality issues, as many of the goals that have come in were not through traffic and were from distance. Special teams aren't helping matters. Texas has allowed eleven power play goals this season on 33 attempts. Perhaps it may appear that Texas is being undisciplined and could improve their PK with fewer penalties. While that's always a good goal, Texas has actually been shorthanded the fewest times in the league with that 33 number. This points directly to deficiencies on the kill. The power play also only has three goals in 37 attempts. That 37 is the second fewest power play tries in the league. In the preseason, Texas generated eight opportunities a game, which would tie them for the regular season lead with the St John's IceCaps. Often, teams that generate lost of power plays are credited with "moving their feet". Texas needs to show that sort of play that they had in the preseason to generate more chances. Then, of course, they need to cash in. The Stars are in last place in the conference. While the margin is very thin (5 points difference with 8th place) and the Stars have played the fewest games of anyone in the conference, it is troubling. After the debacle of the previous season, fans are becoming worried about the prospects of this season. You don't win Cups in November, but you can certainly lose them there. As to the Marlies, the defending Western Conference champs are 4-4-0-1 in the young season. Three of those losses came against very good teams in Abbotsford (#3) and Lake Erie (#4). Ben Scrivens is back in net for the Marlies, but it's actually Jussi Rynnas with the best record among the tenders. Mark Owuya is also on the roster as Toronto is carrying three goalies through the early part of the year. All three have played. Rynnas is expected to start tonight. The Marlies are coming off a 6-4 win at Houston last night. Scrivens started and got the win. As to the skaters, Keith Aucoin leads the ways with 1-7-8, but a minus-4 rating. Touted Maple Leafs defenseman Jake Gardiner is next at 4-2-6. Other highlights include Carter Ashton at 3-1-4, former OKC Baron Dylan Yeo (0-2-2) and often talked about prospect Nazem Kadri (0-3-3). Kadri, however, will be among the scratches along with Joe Colborne. Please note that I am still not in Austin tonight. Apologies for light post updates this week. I will have a postgame update as soon as time and travel allow. I will be back in Cedar Park for next week's games, however. The Stars emerge from hibernation shortly today to faceoff against the Grand Rapids Griffins before receding again and not playing another tilt until next Friday. The Griffins, farm team of the Detroit Red Wings, are having a poor start to the year. They are a dangerous team in the scoring department with 26 goals for in just 8 games. They are led in that regard by Gustav Nyquist, who would undoubtedly be in Detroit without the lockout. Nyquist has four goals and six assists. He is trailed by Tomas Tatar with an even four goals and assists and new addition defenseman Chad Billins with eight assists. Billins is in his first professional year and is a product of Ferris State. Potent offenses, however, must be matched with stout defenses. That was the story last year for Texas and so it is this year for Grand Rapids. They have allowed 31 goals against in their short season so far. After spending most of the season with GRG last year, goalie Jordan Pearce failed to win a game in three starts and was sent down to the Toledo Walleye. Tom McCollum hasn't faired much better, but at least has two wins to his name with a 2-2-1 record. McCollum clicks in at 3.11 GAA and the new backup, Petr Mrazek, has yet to play an AHL game in his career. The Stars will do alright with Grand Rapids if they can weather the storm. Of the 31 goals against for the Griffins, twelve have come in the third period, where they are getting outscored 12-5 overall. Overall, by the way, Texas is getting outscored in every period, but it's worst in the second at a 3-9 deficit. After winning their first two games, Texas has lost four of their last five. Would you believe that the Stars rank in the top three for fewest shots against per game? And yet they rank in the bottom nine in fewest goals against. The difference is striking. There are two explanations. Either the goaltenders are letting in easy ones, which is partly the case given some of the goals that have gotten by this year. Also, shot quality is just as important as shot quantity. If there are 100 shots a game but they all come from distance and without traffic, that game is perhaps more winnable than one where the shots are low but they all come from the high slot and through traffic. The Stars have now changed goaltenders in four of their seven games on the season. That is not a recipe for success.